Petroglyphs are drawings made by early men/women on the walls of caves or rocks. Many of the subjects were animals that were hunted for food or clothing. Most archeologists believe that, by drawing petroglyphs, early shamans were asking the souls of the hunted animals to give themselves up for food or clothing. They were a talisman for luck in the daily hunt. 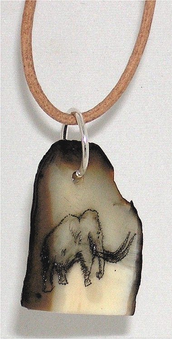 Our Paleo Indian Mammoth Petroglyph Talisman is a replica of an 8000 year old petroglyph found in a cave on the Ukok Plateau on Kamchatka in the western Bering Sea. It is etched on the light side of Fossil Walrus bark Ivory, and the back is left naturally dark bark. 1 7/8 inch high and 1 1/8 inch wide, it hangs from a sterling silver loop with a leather neck thong.